1. 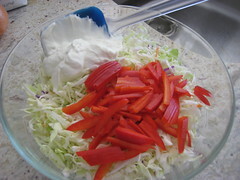 Mix the shredded cabbage, sour cream and one red pepper, thinly sliced. 2. In a food processor or blender (osterize), mix the onion, salt, mustard, sugar, mayonnaise, oil and vinegar until well blended. 3. Add the dressing to the cabbage mix and stir well until fully mixed together. 4. Store in the fridge for at least an hour. 5. Decorate with thinly sliced red pepper rings before serving. Best when prepared a day in advance and stored in a glass covered container. 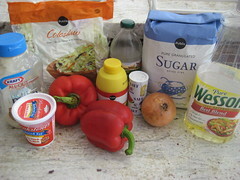 There are a total of 37 ensalada (salad) recipes in The Project. For those of you that are familiar with Cuban salads, you won’t be surprised to read that 30 of the 37 have mayonnaise as an ingredient. Most of those 30 also have cream cheese in them, along with the mayo. The remaining seven? One is a Caesar salad, so you end up making your own mayonnaise in the dressing; one uses bacon grease; one is made with prunes and cream cheese; one is a Chef salad with tons of meat and cheese and the last two have non-flavored gelatin, which is just gross. Weight Watchers and The Project – the irony. 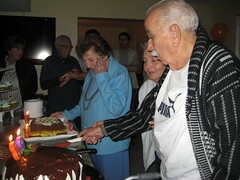 My dad’s family was having a get together to celebrate birthdays and spend some time catching up. It was a wonderful family reunion that brought us to hang out with cousins I grew up with, but unfortunately hadn’t kept in touch with once we all started going out with friends more and family less during high school and the years that followed. I figured that a salad would go well with anything, and I started with the first salad recipe in the chapter – Cuban Coleslaw. What makes this a Cuban coleslaw? I mean, slaw is slaw, right? Well, it has red peppers in it, which I’ve never seen in regular coleslaw, so that right there, was my first clue in knowing this was going to be different. The second clue? I think I uncovered the secret Rio Cristal Restaurant salad dressing. I don’t know if the Rio Cristal dressing is secret, but it sure is my favorite. I can never tell if it’s a French or a mix of French and Thousand Island, but it’s always brought to you when you sit down, in all it’s plastic squeeze bottle glory, and it is just so addicting. 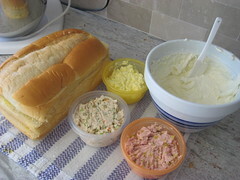 But, let me tell you about the coleslaw process – it’s easy and it can be made in the morning before a picnic or BBQ lunch. Travels well and receives great reviews. Nitza asks you to shred up the cabbage in thin strips, but I went with the Publix Coleslaw mix of green cabbage, carrots and red cabbage, already shredded and perfectly portioned for this recipe that serves twelve (or much more, as I experienced). 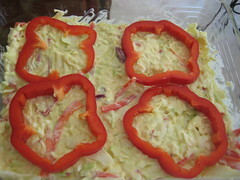 You mix the coleslaw with sour cream and a sliced red pepper. You osterize (I used my food processor) some onion, salt, mustard, sugar, mayonnaise, oil and vinegar until well blended and smooth. 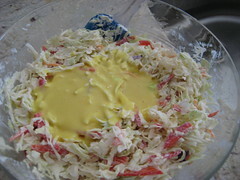 You add that to the coleslaw, sourcream, red pepper mix. You mix it well and put it in the fridge until it’s time to go. And, in true Cuban lady fashion, you decorate it with thin red pepper rings for effect. Lovely. 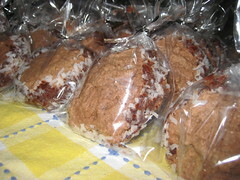 My dad’s cousin, Maria (whom I call Aurorita), found her baking gene and turned it into a business, Home Baked Sweets. She made Tio Manolin’s cake (her dad), Tia Josefina’s cake (her aunt), and even Caitlyn’s cake (her granddaughter). We had a great time. My daughter was so confused by all the new family members she met that day and asks me to explain the connections over and over again. At the end of the day, the answer is still the same: We’re one big family that doesn’t see each other enough and wishes we could see each other more. You’ve got cousins all over the place, in different cities and countries and it’s important to keep in touch. Catching up with everyone was really good – staying in touch is even better. Luckily, we have ways to stay in touch now where we didn’t years ago. I’ve got my cousins on Facebook and we keep in touch with pictures, IM and email. It helps us keep up to date with the little details – which surprisingly, we didn’t even get into when we were little kids. Times evolve, and so do we. But, as has been made clearer and clearer with each recipe I tackle – good recipes don’t change, they are meant to be passed down. Because of The Project, I had a chance to hear stories of my great-grandmother’s cooking and signature recipes. I would have never known about her way of making breadcrumbs from stale Cuban bread or her knack for cleaning out the fridge by making croquetas with anything that needed to be consumed that day – with her own meat grinder that had a clamp that would be attached to the end of her kitchen counter. These are the memories I want my kids to have of their days growing up. These are the memories that shape who they will be in the future. All this from Cuban coleslaw and the secret Rio Cristal salad dressing. Amazing what food can do! 2. Grease two cookie sheets with butter. 3. Beat the butter, adding in the sugar a bit at a time. 5. Melt chocolate in the microwave. 6. 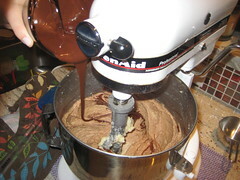 Beat in the melted chocolate to the wet mixture. 7. Sift the flour, powdered milk, salt and baking powder. 8. Beat in the dry ingredients until all is well mixed. 9. 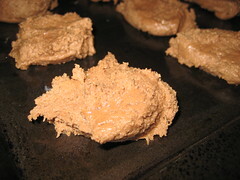 Drop the cookie mixture, by spoonfuls, onto the greased cookie sheets. 10. Bake in the oven for 12 minutes. 11. Set baked cookies on cooling racks. 12. 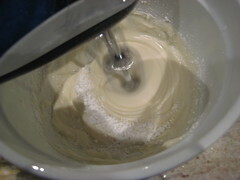 Using a hand blender, mix the cream cheese, mint extract and powdered sugar. Set aside. 13. Melt the butter and chocolate in the microwave. 14. Add the hot water and mix well. Set aside. 15. Get one chocolate cookie and spread bottom side with the mint frosting. 16. 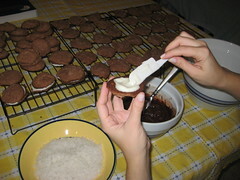 Place another chocolate cookie, bottom side to the frosting, to make a cookie sandwich. 17. Using a knife, spread the outer rim of the cookie with the melted chocolate. 18. 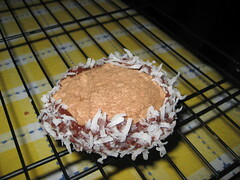 Dip the chocolate frosted rim in the shredded coconut to finish. I should have known from the way this recipe found it’s way to me that it was going to be a memorable one. It wasn’t because of the Cuban-ness of it, as I actually have never had these cookies before nor have met anyone that has made them. No, it was more because of the way my coworker, Ibby, pulled a fast one on me. 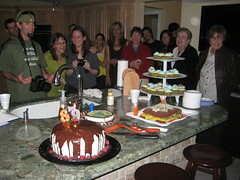 Before I knew it, I had volunteered to bake for our Haiti fundraiser. This was not me on so many levels. As many of you know, I’m not a baker. I was scheduled to be at an all-day training on the day of the bake sale. Prep-day was jam packed with planning for an event we were putting on for work and I knew it wouldn’t be until at least 10:00 p.m. for me to get started baking. So, she signed me up and the stress began. The ingredients were easy to buy, the star-shaped cookie cutters were right there waiting for me at Jo-Ann Fabrics (just like Ibby had assured me when I tried to tell her that I couldn’t bake because I didn’t have star-shaped cookie cutters for the recipe) and the kids were asleep. Time to start baking. For many of you that are cookie bakers, you would have felt right at home with my Facebook friends that were yelling at me from the start, "No! Don’t make a Nitza cookie! Nitza doesn’t know cookies!" Well, well. Where were my friends when I needed them to give me more excuses for Ibby? I plugged away and started beating the butter and adding the sugar in my stand-mixer. I added the eggs, one by one as Nitza Cookie suggested and then added the melted chocolate to the mix. 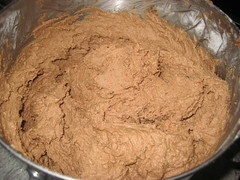 I then added the flour, dry milk, salt and baking powder I had sifted, just as she suggested. When she asked me to knead the dough well and roll it out with a rolling pin, I was excited. It would finally be time to use my shiny new red rolling pin from Williams Sonoma. I should have known better. Just like my Facebook friends had been warning. There was no kneading. No rolling. No touching that wet soggy dough. 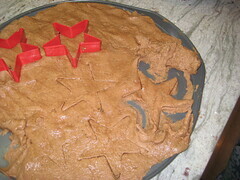 I tried my Pastel de Medianoche dough method of patting it out with my hands and took out my star-shaped cookie cutters. Useless. The cookie cutters just made imprints in the soggy dough and I couldn’t lift a star to save my life. Cookie blobs. My recipe had quickly turned from chocolate stars to chocolate meteors. Ibby’s lucky I’ve known her for fifteen years. Oh boy. I placed my blobs on greased cookie sheets and put them in my oven at 375 for six minutes. Yeah, right. Six minutes. What in the world is wrong with Nitza and her oven times. Minute by minute, I checked until they looked cooked through and at about fifteen minutes, I pulled them out. And they were burnt. 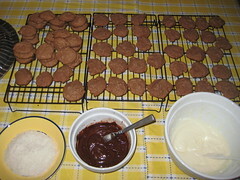 My friend Teresa caringly suggested the name Estrellados de Chocolate (which loosly translates to chocolate disasters). 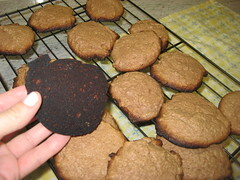 Burnt cookie blobs. The night was getting better and better. The next batch of blobs came out perfect at twelve minutes, so I continued to bake at twelve minutes while I moved on to the next step of making the mint frosting that would serve as the middle of these chocolate cookie sandwiches. The mint stuff was made of cream cheese (of course), mint extract and powdered sugar. I beat that with my hand mixer and set it aside with the cookies that were cooling on the racks I had also conveniently found at Jo-Ann Fabrics. As if this all wasn’t enough, it was time to melt some butter and chocolate chips in the microwave (screw the baño Maria) and a little hot water at the end to let it mix well. I put that aside, along with a plateful of shredded coconut that would come together to serve as a nice outer ring to my cookie blog meteor planet looking things. It was close to 1:00 a.m. when I put the assembly line into motion. Cookie, mint stuffing, cookie. Chocolate spread around the rim. Dip in coconut to finish. 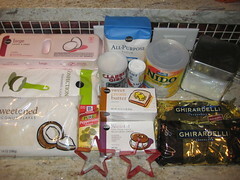 I had bought individual clear bags so that each cookie could be sold at around $43 apiece. All the time and energy? If this was going to raise money for Haiti, it should sell for at least that amount. That’s what I would have priced them at if I were selling them. Good thing I wasn’t the one doing the pricing. Ibby was up with her own baking creation when my husband dropped my donation off at 2:00 a.m. We wouldn’t have sold a thing if they were all priced at $43 each. And, from what Ibby tells me, the drive to work in the morning was quite adventurous for our baked goods – someone cut her off and all my cookies flew out of the bag, shooting meteor style, almost missing their chance to raise money for the bake sale. At the end of it all, we held a successful bake sale for Haiti and donated the funds through Operation Helping Hands (a partnership we have with United Way of Miami-Dade, Univision Radio and Univision 23). I didn’t try one of the cookies in their entirety (but did allocate about 10 points for the tasting process – gross), but they were all sold, at a reasonable price. There’s a whole chapter dedicated to cookies, and this happened to be the first one. If this is how we’re going to start, I think I can wait till I get to the next one, Tejas. Besides being a really bad haircut for men (think mullet) and a roof tile style, what in the world is a teja? I’d greatly appreciate any pitfalls before making an attempt at Recipe #489. 3. 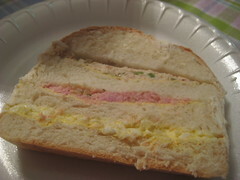 Spread the egg pastica on the bottom bread slice. 4. Spread the ham pastica on the next bread slice. 5. 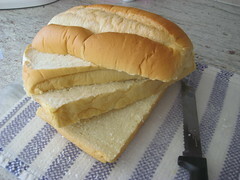 Spread the chicken pastica on the next bread slice. 6. Top with the loaf of bread lid. 7. Cover the entire sandwich with the cream cheese mix, as if you were frosting a cake. Recipe calls for serving 8, but can easily be cut to serve 16. If keeping in the fridge, leave uncovered for a few hours before serving. It’s a giant sandwich. 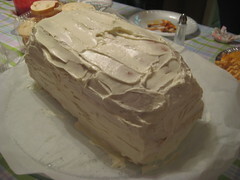 A giant, three tiered sandwich, covered in cream cheese. Only a Cuban cookbook would have anything so enormously over the top (well, I’m sure there are other books out there with exaggerations such as this, but I wouldn’t be Cuban if I didn’t contribute to the exaggeration). I was floored when I read through the ingredients and preparations. There was only one day worthy of this recipe – Super Bowl Sunday. And the title of this post is not the real name of the recipe, it’s just the phonetic way to say ‘sandwich’ in Spanish – ‘sangüiche’. That’s courtesy of my friend, Lourdes, that’s always there to lend her two cents on Cubanisms. Glad to report, as with most of the recipes, that this is not a difficult one to make. Lots of prep work can be done ahead, which I don’t ever seem to do, but if you plan properly, you can put this together in no time. The key is to make the pasticas (spreads) and the cream cheese frosting (¿Que? Don’t worry, I explain later) ahead of time, so you can layer up the sandwich and cover it before the party. You start off by buying an uncut loaf of white bread, which has been readily available at Publix each time I’ve needed it. You cut the bread yourself into four slices, end to end, so you can build your pastica tower layers. 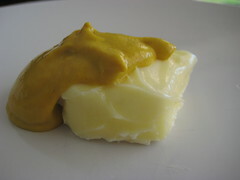 You mix mustard and butter and spread it on each slice of bread, kind of like a base before you put the pastica on it. I think you do this to form a kind of barrier so the pastica doesn’t make your bread soggy. 1. 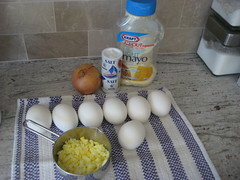 Pasta de huevo (egg) – hard boiled eggs, chopped onions, salt and mayo. Note: I boiled all those eggs in the photo below because I had no clue how many you needed to chop up in order to get to 1 cup. Well, you only need 2 hard boiled eggs to make 1 cup of chopped eggs. Can I interest anyone in a hard boiled egg? 2. 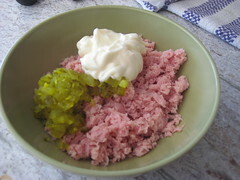 Pasta de jamón (ham) – ground ham, chopped pickles and mayo. 3. 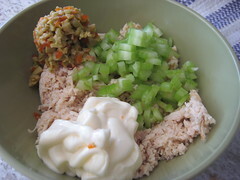 Pasta de pollo (chicken) – cooked shredded chicken, celery, olives and mayo. Remember to make each one ahead of time. I’m starting to come to terms that my inability to arrive at the start of the party is because of my lack of prepping. If you like to show up with an appetizer dish around dessert time, go right ahead and do everything the same day (this recipe took me over four hours to make in one shot – we got to the Super Bowl party right in time for halftime). If you like to be on time, like I strive to do one day, prep ahead. 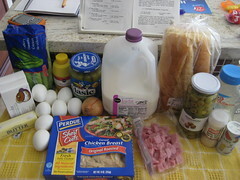 You layer the egg spread on the bottom layer, the ham spread next and finally the chicken spread before you top it all off with the lid of the loaf of bread. 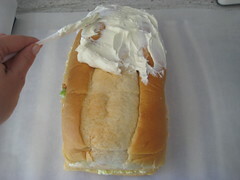 Then, you "frost" your sandwich with cream cheese. Why, oh why, did someone have to take this just one step further and come up with the idea to frost this sandwich with cream cheese. The cream cheese frosting is a mix of cream cheese, garlic salt and a bit of milk. Marta: ¡Yo hice un sangüiche con pastica de jamón el otro día que estuvo riquísimo! Esperanza: ¿O, si? Yo hice uno de pastica de jamón y pastica de huevos. Use los huevos de El Liro. Saben que uso solamente los mejores ingredientes para mis pasticas. Concepción: Pues, yo tuve pollo, también de El Liro, que me sobró de la noche anterior y hice una pastica que estuvo divina. Decidí hacer un sangüiche que fue como una torre – pastica de huevo, pastica de jamón y pastica de pollo. ¡Fue una delicia! Fela: Ay por favor. Ustedes no están en nada. Yo hago ese sangüiche para todas mis fiestas. Pero lo que yo hago, viene de una idea que se me ocurrió el otro día – lo cubro todo con queso crema, como si fuera un cake. Tremenda presentación. Todos mis nietos les encantan este sangüiche gigante. ¡Es un vicio! I’m glad they stopped there. I can’t imagine what would have happened if Elena Ruz would have shown up! 1. 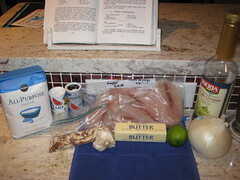 Clean the fish filets and marinade them in the minced garlic cloves, salt, lime juice and black pepper. Marinade at least 30 minutes. 2. 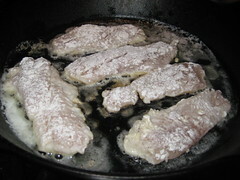 Dredge the fish filets in flour and fry them in butter you have melted in a hot skillet. 3. One fish have been fried and are golden on both sides, remove the filets and place on a serving plate. 4. 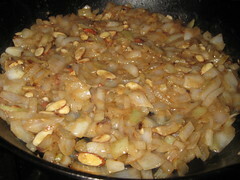 Place the chopped onion in the butter left in the skillet and sautee the onion until softened. 5. In a measuring cup or bowl, dissolve 2 Tablespoons of flour in the white wine. Add this liquid to the sauteed onions and mix well. Let sit on medium heat until it starts to thicken. 6. Add the almonds to the thickened sauce and pour over the fish filets. Makes 4 servings. Serve hot. If you prefer a less-thick sauce, add only 1T flour to the white wine. I know I’ve mentioned before that there are some recipes I just didn’t grow up with and some I’m not familiar with at all so that it’s hard for me to visualize the end product. This recipe happened to have been a little of both. It wasn’t until I actually sat down to eat it that I realized that it’s one of those fish variations that restaurants in the Keys offer. - Lorenzo: lightly breaded, sauteed in lemon, butter and sherry, topped with mushrooms, crabmeat stuffing and bernaise sauce. This one always makes me smile because I think of my friends (with last name Lorenzo) taking their catch in and asking them to cook it "their" style – I don’t know if they do that, but if my last name were Lorenzo, I’d do it. 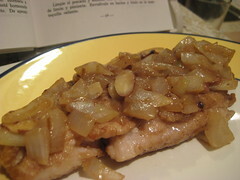 - Senator: lightly breaded, sauteed in lemon, butter and parsley with mushroom, almonds and sherry. - Meuniere: lightly breaded, sauteed in lemon, butter and parsley. I never really took the time to think through the variety of preparations – possibly because it wasn’t something I could visualize. I would go with the Lorenzo style most often, because of the simple reason I mentioned above – it was the only one I could relate to. I don’t personally know any Senators. And, after Googling ‘meuniere’, I found out it’s a french method and a french sauce, so I didn’t have any affiliation there, either. As you can see, I’m very thorough in my food selection process. This was the last of the snapper that remained from my husband’s fishing trip last summer. It held up pretty well in the freezer all this time. 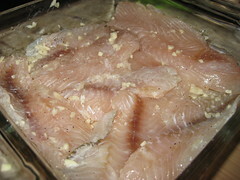 Nitza calls for a pound of pargo (snapper) filets to be marinated well with garlic, salt, juice of a lemon and black pepper. Once I finished the marinade, I let the fish sit in it while I prepared my Killer Rice. Once the Killer Rice was under cover, I got back to the fish. You basically take the fish out of the marinade, dredge it in flour and into two sticks of butter you’ve melted in a skillet. Once the fish is done on both sides, you take the filets out and get to the Almondine sauce. In the same skillet, with the butter that was left over, you sautee a chopped up onion. While that sautees, you add some flour to white wine in a measuring cup. Make sure the flour dissolves and when the onion is ready, you add in the flour white wine liquid to the skillet. Once the liquid starts to thicken, you add the slivered almonds (Nitza asks for them to be toasted, which I hadn’t noticed until this point, so I went with just untoasted slivers). The sauce becomes thick and creamy-like. Once you get to the thickness you like, pour it over your fish filets and serve with Killer Rice to your hungry family. The smell of this preparation will give you an audience, guaranteed. So now, with this recipe under my belt, I can tell you there’s a whole other world out there besides Snapper Lorenzo. Key Colony Inn has Snapper Almondine on their menu and I can picture myself showing up with this version of it for them to explore. That, or I’ve got to get myself back to Key Colony Inn for some secret taste comparisons.